PLO Secretary General says Trump’s senior adviser "represents a policy of dictation". 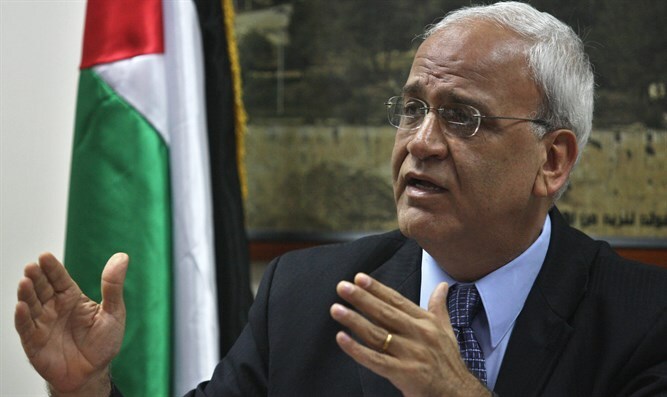 Palestine Liberation Organization (PLO) Secretary General Saeb Erekat on Sunday blasted Jared Kushner, U.S. President Donald Trump’s senior adviser and son-in-law, after Kushner gave an interview to the Palestinian Arab newspaper Al-Quds. But Kushner also criticized the PA chairman, who has refused to consider the Trump administration an honest broker for peace negotiations with Israel since Trump’s recognition of Jerusalem as Israel’s capital last December. Kushner and Jason Greenblatt, Trump’s Special Representative for International Negotiations, are visiting the Middle East for discussions with local leaders about Trump’s peace plan but are not scheduled to meet PA officials due to their boycott. "President Abbas says that he is committed to peace and I have no reason not to believe him. However, I do question how much President Abbas has the ability to, or is willing to, lean into finishing a deal," Kushner said in the interview with Al-Quds. In response, Erekat said on Sunday that Kushner's interview showed "there's nothing of substance" coming from the Trump Administration. "Kushner represents a policy of dictation rather than negotiations. It is the Trump Administration that has walked away from the negotiations, from international law and UN resolutions," Erekat charged. The interview, he continued, is "an attempt to push forward a plan that consolidates Israel’s colonial control over Palestinian land and lives while telling the Palestinian people that money will compensate for our inalienable rights. Plain and simple: Palestine and Palestinian rights are not for sale." Erekat added that Kushner and Greenblatt "have heard it clear from our fellow Arab leaders that the core of the solution should be grounded on ending Israel’s occupation of Palestine and the establishment of a sovereign and the independent State of Palestine on the 1967 borders with East Jerusalem as its capital." While Trump’s peace plan has not yet been made public, PA officials have already rejected it outright, claiming it has been coordinated with Israel.